Last week, the girls and I stopped in at my aunt's farm for a quick visit. We were bringing her dinner, giving her a night off during her week of wedding prep for her son's wedding reception that would be held at their farm. I'll have to bring her dinner more often. When we drove home, the car doors barely shut. 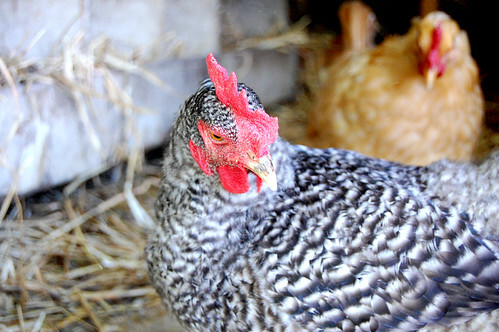 Though we only showed up with a casserole and bread, we came home with a quart of blueberries, two dozen eggs, a bale of straw, and five hens. It felt like an episode straight out of the beverly hillbillies–chickens squawking, straw flying out the car windows, barefoot kids munching on blueberries, and the smell, oh we won't talk about the smell….. So five new girls came to join little old Henny Penny. Who suddenly thinks she's top dog around here–and puts on quite a show when the food comes out. But I'm sure she'll settle down, eventually. The new girls are a somewhat scrappy-looking bunch. Blondie back there was broody at her old digs, and took a lot of pecking while she guarded her "nest". The others lost a few feathers during their couple days in confinement, as they learned the ropes of their new digs. And Elizabeth, the apparent self-proclaimed chicken farmer, always manages to keep things interesting. 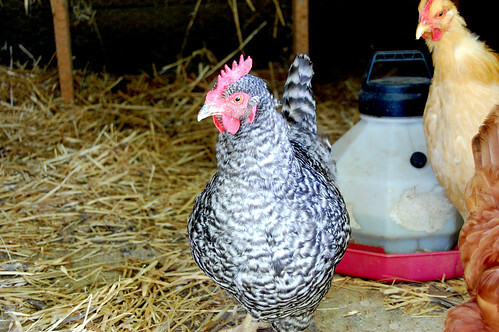 On the second day of the chickens' arrival, when we were still keeping them penned so that they would settle into their new home–Elizabeth was found out in the chicken coop. We were getting ready to leave for dinner and when she came over from the coop, I assumed she was checking nesting boxes for eggs. Little did I know, Miss Smartypants was opening the door and letting all the new hens have a premature taste of freedom. Catching them that evening, as dusk fell and fox-hour arrived was quite "interesting". There were brooms and hammers and possibly even a few four letter words involved….possibly. The new girls still haven't learned the ropes of getting their picture taken. They didn't grow up in front of the lens, like Henny Penny. They don't know that when I cluck at them, they're supposed to pose and hold still. But since they're already giving us eggs, and we're counting again, I'll let it slide. Kids just can resist. 🙂 I love the black and white hen! Does she give colored eggs? How fantastic! I hope to have a house full of hens at some point in the next couple of years. I’m so glad henny penny has some company now. Maybe you should get a llama to help scare the fox? but did you sprinkle the feed in front of the camera!? 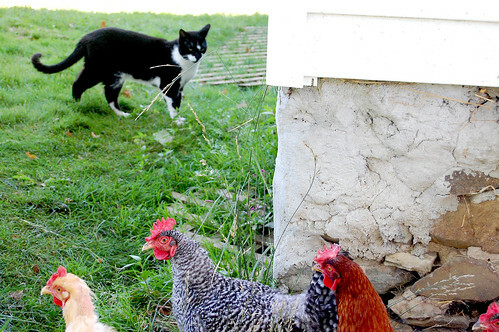 we just got a new batch of chickens too, hoping it would take some pressure off my porch with all that chicken bidness… maybe they could all get along and old chickens could live within fencing with new chickens… this is not the case!!! but now we have eggs instead of just chickens, and I am pretty sure they will succumb to the romance of the rooster soon… good luck with yours! fun to have eggs again!!! Love it!!! Though I wouldn’t go too often to your Aunts or you just may have a full farm on your hands. What beautiful chickens! We are eagerly anticipating our first egg from our girls. We can’t wait to start counting too. I know you’re not supposed to have favorites, but our random Barred Rock (the black and white) is my favorite. She’s so sassy. 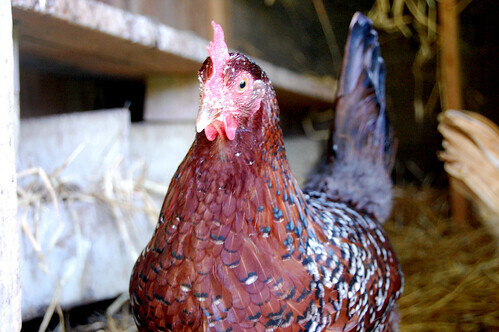 We came about our chickens the same way you did… by accident and unprepared. But we’ve loved it. We’ve also had a few nights of chasing with brooms 🙂 I know exactly what your adventure the other night looked like! Glad to hear you have some new chickens! Plus they are laying eggs already! How are the ducklings doing? yay!and that elizabeth….i love her independent streak. Great chickens! Wish I had some of my own.